Last weekend Montana skipped straight from the heat of summer to its first snowfall. It didn’t stick much at the city level, but nonetheless resulted in a lovely “November” run on Saturday, and the snow-capped mountains are a welcome relief from the smokey haze we’ve been battling for weeks. When the weather cools I start thinking about soups and chilis like any sane person, but I also think a bit more about quick freezer meals. One of my (many) odd quirks is that I really prefer not to bake in the dark. I have no idea where this mentality came from, but it sometimes makes the blog posts challenging in those few months of the year when all the daylight is during work hours and the weekends are filled with skiing. Arriving home in pitch black also makes me much less inclined to start a full dinner, and if I don’t have leftovers to reheat I usually end up with a grilled cheese or scrambled eggs. Despite my love of both, they do get a bit repetitive (and not particularly healthy) when eaten too often in lieu of a proper dinner. 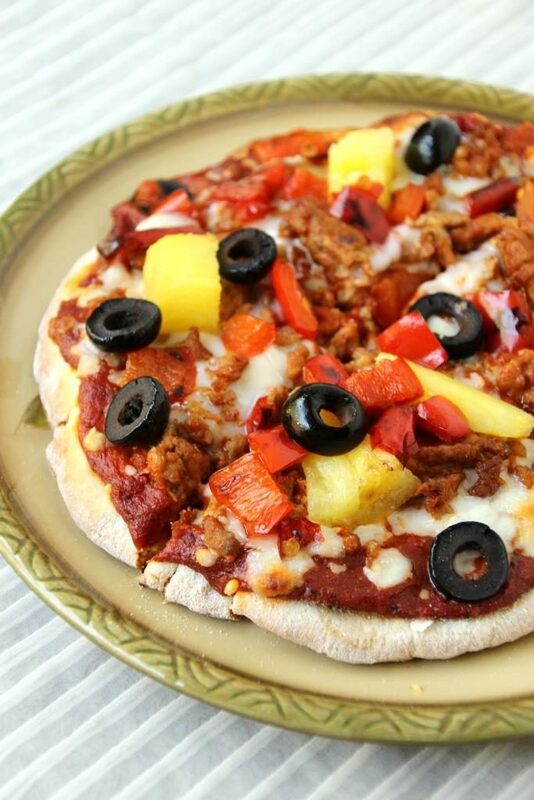 A staple of most college kids, frozen pizzas are a quick and easy dinner for those busy evenings. I personally never buy them, since the odd ingredients and all-or-nothing style of vegetables don’t appeal to me, but the idea seemed incredibly sound. Armed with my mom’s dough and sauce recipes, I set off to make my own. I pre-baked the crust to make it a little sturdier for storage, then topped them all with my favorite mix of meat, produce, and cheese. I am one of those people who likes fruits on their pizza, so sorry (not sorry) in advance if my pineapple and mandarins repulse you. I made one that evening, then froze the remaining five before wrapping in plastic wrap and sealing in Ziplocs to try another day. Like the store-bought variety, these can be baked directly out of the freezer, sans all the wrappings. The bottoms have a tendency to brown faster than the cheese melts, so bake them one rack above center. If you are truly anti-crispy with regards to crust, bake on a silicon mat instead of directly on the baking sheet. They keep a month or two in the freezer with no dip in quality, and would probably last longer if you don’t eat them before then. Alternatively, instead of adding the toppings right away, you can freeze the crusts naked and top when you bake them. This takes away a bit of the preparedness, of course, but has the added benefit of letting you add whichever toppings you feel like that day. It also gives you a bit more flexibility since certain toppings (like leafy greens, berries, raw tomato) may not freeze quite as well. I made mine into small personal sized pizzas as their intended to be a one-off meal, and also so they fit nicely into gallon Ziploc bags for storage. You can make one pizza for tonight and freeze the rest for later, which makes the effort of mixing your own dough and sauce a little less off-putting. Despite the long list of ingredients, this is actually an incredibly easy project, and if you have all your toppings cut ahead of time it’s even fast enough for a weekday meal. 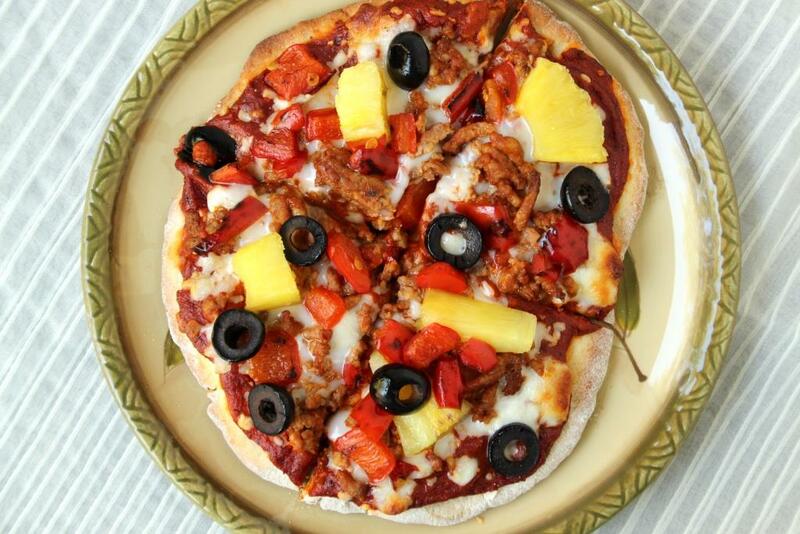 Personal pizzas are also great if you have a variety of preferences in the house. M prefers a very high meat:not meat ratio, and loathes olives with a fiery passion; I prefer just a touch of meat and often experiment with more unusual combinations. Having individual pizzas for each of us makes it easy to customize the amounts of each topping, with no chance of contamination. With school back in session, hunting season underway, and the cold weather imminent, this is a great time to prep a few meals for future nights. Make up a batch or two of dough and in an hour or two you can have 8-10 meals in the freezer for later. For the sauce: In a large skillet or saucepan over medium heat, melt butter and oil. Add onion and garlic and saute until onion is soft and transparent. Add remaining ingredients and bring to a simmer. Continue to simmer at least 30 minutes for best flavor. Remove bay leaf and use an immersion blender to puree until smooth. For frozen pizzas, let cool completely and store in the fridge until ready to use. For pizzas you’re baking right away, you can use it now. For the crust: In the bowl of a stand mixer, add sugar and yeast. Slowly stream in water and stir gently. Let rest 10 minutes, until yeast has foamed. Gently and briefly stir in flour, salt, and oil. Using the dough hook, beat on low until dough comes together and pulls away from the sides. Let rest for 5-10 minutes. Preheat oven to 450 degrees Fahrenheit and sprinkle pizza pans or cookie sheets with cornmeal. Set aside. Sprinkle your counter or a cutting board with flour. Divide dough into desired number of servings and gently roll into circles. Transfer to prepared pans. Bake for 5-12 minutes, until crust is just starting to firm up. For mini pizzas this will be 5 minutes, for one large pizza it could be up to 12. If you’re making frozen pizzas, be very careful not to over bake. Remove from oven, and allow to cool slightly (for eat it now), or completely (for frozen pizzas). Assembly for eat it now: Spread sauce onto crusts to within 1/2 inch of edge, and top with desired toppings. Bake an additional 10-20 minutes, or until crust is desired crispness, cheese is melted, and toppings are warm. Assembly for frozen pizzas: Allow crusts, sauce, and topping to cool completely. I like to prep everything on one day, store the sauce in toppings in the fridge overnight, and then make the pizzas the next day. Crusts are fine on the counter in an airtight container. Spread crusts with sauce to within 1/2 inch of edges, and then add desired toppings. For mini pizzas I about 1/2 cup cheese and 1/4 cup meat, then arrange the other toppings as they fit. Transfer pizzas to cookie sheets or cutting boards and then freeze until solid. Remove from freezer and wrap each pizza individually with plastic wrap, then place into Ziploc bags or airtight containers for longer-term storage. They should keep just fine for a couple of months if they are well wrapped. Pro tip: Use tape or labels to write baking instructions on each pizza. If you have leftover toppings, use them for scrambled eggs or omelets, on salad, or freeze for later use. Baking: Preheat oven to 450 degrees Fahrenheit and for crispy crust on large pizzas move rack to one below center. For personal frozen pizzas with frozen toppings, you may want to move rack to one above center. 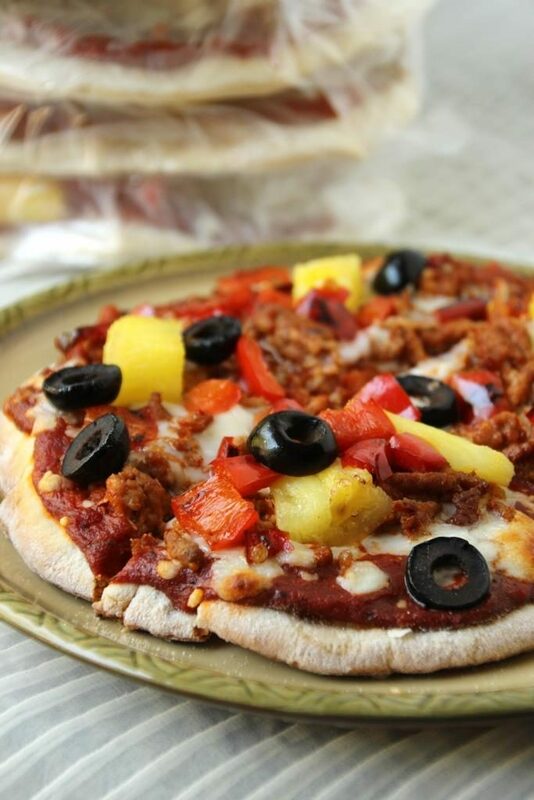 Unwrap frozen pizza and place on a cookie sheet or pizza pan. For less crispy crust, use a silicon mat. 1 Lots of options here: one family sized pizza, two larges, 3 mediums, 4-6 personal sized pizzas. I did 6 smallish personal-sized pizzas because I like to have a side salad to make a well-rounded meal. Feel free to do whatever sizes suits you! 2 These are the toppings used in my pictures, but mix it up or make substitutions to fit your dietary needs/preferences.